Several of my friends assure me that an unmarried woman’s primary concern in life is to find a husband and thereafter to make a comfortable home for him and raise a family. If this is so, then Miss Ann Beardsley of the Baptist Chapel Yard in South Street has started on her journey to fulfill these desires — though not in the order suggested by my friends. Ann, who lives with her widowed father William, is a woman of dubious reputation — it is claimed. She has, in the past, formed frequent liaisons with men both older and younger than herself, resulting in several illegitimate children. Her latest ‘beau’ seems to be Henry Hughes, a furnaceman in his late twenties, who has lodged with the Beardsley family for several years. Last November Henry decided to supplement his income by stealing four pecks of potatoes, the property of Joseph Siddons who lives nearby. Not content with getting himself into trouble with the law, Henry persuaded Ann to hold the stolen goods and sell them on. Both appeared, undefended, yesterday at Derby Assizes where they were quickly found guilty of larceny … and will spend the next three calendar months at Derby gaol. Local gossip — not the most reliable of sources — reports that the father of Ann’s elder daughter, Elizabeth, is Mark Lacey, a boatman once residing in Cotmanhay. A few years ago young Mark ‘escaped’ the town and enlisted with the First Battalion Grenadier Guards … whether the birth of Ann’s daughter and Mark’s army enrollment are connected by coincidence or causality I would not know. Mr Pollard has recently moved out of Bath Street into the Market Place … let me repeat that I have received no remuneration for this insert. It appears that these days Nottingham continues as an extremely unsafe place to display valuables. A week ago Francis Sudbury, glover and hosier of South Street, was in that metropolis conducting business, and happened to leave his cart at Black Bull Yard in Parliament Street for a few moments … but long enough for some miscreant to steal six ten-pound bundles of cotton from the vehicle. Within the last week the same fate has been suffered by a small loin of beef from a butcher in Beck Lane, some linen on a clothes line in Carter Gate, sixteen cotton handkerchiefs belonging to Bassett drapers of Pelham Street, five volumes of the Bibliographical Dictionary on the book stall of Mr. Wilkinson in the market place, a bag of merino cotton and groceries from a cart travelling out of Nottingham to Sherwood, a pair of blucher boots from the shop door of shoemaker Valentine Sotheran in Count Street, a parcel of twenty-nine brown cotton ribbed-tops from a cart in Hounds Gate, Henry Robinson’s black cloth overcoat from a house in Pelican Street, a piece of bacon weighing a stone from John Robinson’s shop in Southwell Road, and …. I could go on but I am sure the picture of lawlessness is emerging !! …. And Nottingham is not alone in harbouring villains !! John Scattergood is a shoemaker trading in South Street, close to the Baptist Chapel Yard and the pawnbroking establishment of John Moss. He awoke yesterday morning to discover that his house had been broken into and that many items had been stolen — he is still making an inventory of these but so far has included 40 pairs of boots, three pairs of slippers, two shirts and two shirt fronts, one coat and one waistcoat — some of these being for sale but some are his personal property. There was also a scarf, the property of Benjamin Cholerton, among the stolen items. There are suspects and the authorities have set out in pursuit !! John had recently employed an 18-year-old apprentice named Samuel Somers and the lad has now disappeared from the town … his departure may have innocent reasons behind it but he would be well advised to return and explain himself. The shoemaker has also been troubled recently by a journeyman, Stephen Sherwin, looking for employment .. he had been turned away by John who suspects that he may be involved in the burglary. The local constables and the police in Nottingham are on the case and arrests are ‘anticipated’. Stephen Sherwin — whom I mentioned in connection with the burglary at John Scattergood’s premises — has been arrested in Nottinghamshire and has been committed for trial at Derby Assizes in a couple of months’ time. I hope to add further details nearer that time. Richard Bramley, who trades as a coal dealer at Hunger Hill, has recently fallen foul of the ‘overseers’ of the Nottingham and Ilkeston Turnpike. On the 13th of this month he was adjudged to have avoided the toll charges on his two carts travelling into Ilkeston. However when he appeared before the magistrates at Nottingham Shire Hall a couple of days ago, it was decided that the evidence was sufficiently inconclusive and the charges were thus dismissed. The toll collectors at Ilkeston are extremely ‘vigilant’ , some say ‘over-zealous’ !! Richard is the son of two of Ilkeston’s more senior inhabitants … Thomas Bramley who serves the opposite end of town — Cotmanhay — also as a coal dealer, and Hannah … both now past their ‘three score years and ten’. In January I reported upon a burglary at the premises of cordwainer John Scattergood. Now, at last, a result …. perhaps !! As reported, Stephen Sherwin has been apprehended at Eastwood by the Nottinghamshire police; some of the stolen property was found in the garden at the back of his lodgings, though the journeyman has pleaded a defence — that he was given the articles by the other suspect, apprentice Samuel Somers. The latter was arrested at Derby a couple of days ago … wearing the trousers of Silas Scattergood, John’s only son !! The accused pair will appear at Derbyshire Lent Assizes in about a couple of weeks time. Yesterday night two poachers, supposedly from Ilkeston, were lurking on the estate of Lord Middleton at Cossall. What they didn’t know however was that two estate gamekeepers with two large dogs were out at the same time. And the two groups collided !! The result was that the two dogs were shot, one keeper was shot in both legs, .. and two poachers escaped. My old friend George Small has been called out to trace and apprehend the villains … so far without success. My old friend George Small reports to me that at the recent Vestry Meeting, held at the National School-room in the Market Place, he was once more nominated as a constable for the coming year. 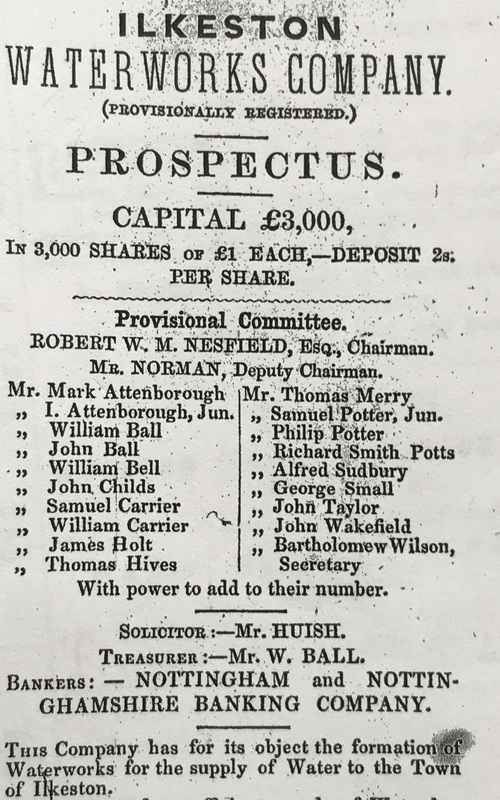 Also nominated as constables were Esau Hooley, cordwainer of Hungerhill; William Thompson, rope maker of South Street; John Ross, auctioneer of Bath Street; Charles Chadwick, butcher of Ilkeston Common; and John Pinder, cordwainer of Cotmanhay. Interestingly, only one of these fine gentlemen was born in the town … and it wasn’t my old friend !! It appears that on April 5th of 1852, Thomas Ballard, aged 35, an ironstone miner then residing at Codnor, married a young lass, Jane Cooper, at the Independent Chapel in Pimlico, Ilkeston. Nothing of note in this event ? Except that it was the second marriage of the miner — and his first wife, Mary née Cutts, was alive and well and living at Codnor. This detail was revealed at Derbyshire Lent Assizes yesterday when Thomas was indicted for his ‘matrimonial greed’, and certified evidence was produced to prove the crime of bigamy. As if that were not enough, a witness at the first marriage at Alfreton in 1844 and the ‘bride’ at the second one both came forward to testify against the accused. The latter however had a defence — his first wife had deserted him and then he was told that she was dead, thus leaving him free to marry again !! No-one was convinced — least of all the magistrate who was now even more sure of his guilt. Because of the dubious conduct of his second wife the severity of the sentence upon the bigamist was reduced … four months imprisonment. The two miscreants who broke into John Scattergood’s South-street premises at the end of January this year appeared at the Derby Court where unsurprisingly they were both found guilty of burglary. Samuel Somers and Stephen Sherwin, both 18 years old, were each sentenced to 14 years’ transportation. Thomas Porter was an old cottager who lived in the Gallows Inn district of the town. His servant reported that a couple of days ago the old man got up around 6 o’clock as usual, lit his fire, drew the shutters and went out into his garden … whereupon he fell down and expired almost immediately. A sad event but not a surprise … Thomas was at least 80 years old. An inquest is to be held tomorrow but I suspect that the verdict will be one of ‘Natural death’. Robert Lebeter of the Middle Road on the Common has just commenced business as a cab proprietor — a need for which is felt by many people in the town in general and in that area in particular. However, Robert should perhaps heed the warning from the Pioneer .. it seems that he must navigate his vehicle around the heaps of dirt that lie on each side of the road for days on end. And if he should engage with another cab, driving in the opposite direction, then he will have to ride over the dirt-heaps to avoid collision … and who knows what will happen then ? He may even encounter an inert pedestrian, rendered immobile by the lakes of sludge found in that neighbourhood. And these may not be Robert’s only dangers. The stagnant ditches, noisome filth and ash heaps at the Common are an obvious invitation to King Cholera to once more visit the town. At the recent election for the Ilkeston representatives of the Guardians for Basford Union, John Ball received 726 votes while Henry Ash polled 581 votes … both were thus appointed to the two posts. The unlucky candidate was Richard Evans who returned 221 votes …. not quite enough !! Yesterday was the Public Day of Humiliation and Prayer, observed throughout the Kingdom .. when the population was exhorted to pray for victory in the Eastern War against the Russians .. and I am pleased to report that the majority in Ilkeston sought to join this solemn occasion. Most labour and trade in the town ceased. Congregations at St. Mary’s Church, both morning and afternoon, were very large. Vicar Ebsworth preached in the morning, from Deuteronomy 23: 9, …. …. When the host goeth forth against thine enemies, then keep thee from every wicked thing …..
….. while the curate the Rev. John C.H. Deacon, preaching in the afternoon, used Isaiah 58: 3-9 as his source …. Then shalt thou call, and the Lord shall answer; thou shalt cry, and he shall say, Here I am. If thou take away from the midst of thee the yoke, the putting forth of the finger, and speaking vanity. As if to reinforce the point I was making on April 1st, I hear that Mrs. Elizabeth Hitchcock, wife of miller Henry at the Rutland Mill, was injured a few days ago in Chapel Street. Travelling along the narrowest part of that road with her children, and with a pony and phaeton, she encountered a pile of lime and rubbish at which the pony shied — the carriage wheel hit the corner of the Slade Chapel building and overturned the vehicle. Fortunately all involved in the accident escaped unhurt. The Ilkeston Pioneer has recently been reflecting upon the general health of our town and its inhabitants .. with some justification. Some of my readers may be aware of the work of the renowned utilitarian and social reformer Edwin Chadwick. In recent years his investigations into the question of sanitation and public health, aside Dr. Thomas Southwood Smith, have helped in the passing of the 1848 Public Health Act — which, among other provisions, led to the establishment of local boards of health, if desired by the local community. This legislation and the improvements suggested within it, naturally reflect the belief of Mr. Chadwick that disease is caused and spread by impure air — if these impurities can be eradicated then disease will be controlled and reduced. To this end what is needed is a regular supply of pure water, for personal hygiene and domestic cleansing. And of course the effective and regular removal of ‘nuisances’ from the environment. Ilkeston is without a local board of health and the Pioneer has taken up the cause to rectify this situation. Like Mr. Chadwick, it believes that a polluted atmosphere and a perfect state of health cannot co-exist .. thus Ilkeston needs to rid itself of ‘accumulations of filth, defective drainage and bad ventilation … it needs a Board of Health !! We shall see but readers will also be aware of the glacial pace of improvements within the town. One man who has seen clear improvements within this town is ‘Venerable Whitehead’ … he has long been writing a series of articles appearing in the ‘Ilkeston Pioneer’, his most recent one printed in last month’s paper. Entitled ‘Ilkeston as it was — is — and is to be’, it was devoted to the present state of the town. I cannot better the words of this clearly well-educated local scholar, and so I hope he will excuse me if I copy his own description .. with a few explanatory parentheses and a ‘shuffling’ of the original. “I stood on the battlements of that ugliest of church towers (of St. Mary) on a December day in last year and cast my eye over the fair scene before me. … Where I had known crazy and crumbling cottages, mansions had arisen. — Rows of well-built houses had usurped the place of back and black slums. — A new church (of Christ Church in Cotmanhay), schools (the British School in Bath Street and the Girls’ National School in the Market Place), chapels (the Wesleyan Chapel in South Street and the Primitive Methodist Chapel in Bath Street), baths, institutes, were pointed out to me. “It was market-place … had stalls of beef that reflected credit on the neighbouring agriculturalists. The manners, dress, and depotment of the rustics that were frequenting it had improved as much as the buildings that surround it. No fighting was going on — no ‘cocking had congregated its dark groupe in Lawn-lane or Hunger-hill …. “In many a spot where dung-hills were wont to lie deposited, shops, with elegant fronts glittering with plate-glass and shewing advantageously rich and rare wares within, now meet the eye.. In one the fashions are displayed; in another creature comforts; even in Mr. Churchwarden Riley’s shop, glass has usuped the place of lattice-work, and early fat lamb, beautifully-grained beef, and South-down mutton, form a picture that a Dutch painter might revel in. “I think there is a great room for the talents of a good architect, or perhaps for an architectural society in Ilkeston … and a LOCAL BOARD OF HEALTH would have power to prevent the creation of any house in which the comforts, privacy, decency, health, and morals of future inmates are too often disregarded. …. Paltry, gimcrack houses are not worthy of the good sites which the Market-place and principal streets afford — Men of Ilkeston ! look to these things. Have a pride in your good Town — regard it has having capabilities for becoming one of the first towns in the Midlands”. My old friend George Small — never reluctant to broadcast his successes — has been telling me about his horticultural prizes won at yesterday’s exhibition of the Nottingham Horticultural Society, held at the Exchange Rooms. Against very stiff and renowned opposition, George carried off first prize for the six best fancy geraniums; second for greenhouse plants; first for pelargoniums; the first for single specimen and fancy geraniums; the first for calceolarias, both the collection and single specimen; the first for a collection of petunias, including Picta, Striata, Enchantress, Motely, and C. Perfecta; and first prize for a pan of cut pansies. This is not the first time that ‘Ilkeston’s premier nurseryman’ (his words not mine) has brought back exhibition prizes against very strong competition. And more is to be expected as we are now entering the exhibition season. News has just reached town, from the Punjab, India, of the death of Isaiah Rice, corporal in the 32nd (the Cornwall) Regiment of Foot. The young man was a son of James Chadwick Rice senior, a framework knitter living in Chapel Street, and his wife Hannah. I believe that this branch of the Rice ‘dynasty’ formerly resided at Kirk Hallam (in the previous century) but has for many years lived at Chapel Street — still known to many locals of that area as ‘Rice’s Lane’. Isaiah had been in the army for about 12 years. I know no detail of the circumstances of his demise. ‘Ilkeston’s premier nurseryman’ and my old friend, George Small, has once more been rubbing shoulders with exalted company … and no more than he deserves. His horticultural skills are a match for any in this district. Last week he was exhibiting once again at the Nottingham Arboretum, alongside Mr. Cholerton, gardener to Edward Joseph Lowe esq., celebrated author and botanist of Beeston, Mr. Jackson, gardener to the Rt. Hon. Lord Scarsdale of Keddleston Hall, and Mr. Dryden, gardener for William Evans esq. of Allestree Hall. Thomas Hives of the Mineral Water Baths in the town is once more announcing a season of renewed business. He states that since last season there has been considerable building repair, while the pleasures of the archery-ground, bowling-green and attractive walk-ways remain. The waters will of course continue to alleviate the symptoms of rheumatism, sciatica, lumbago, paralysis, scrofula, skin infections, piles and liver complaints, gravel and stone in the bladder …. how blessed are the patients of Ilkeston !! Any invalids visiting from out-of-town will note that the Baths are a mere stone’s throw from the terminus of the Ilkeston Branch of the Erewash Valley Railway. William Riley, butcher of Bath Street, and Henry Mantle Hitchcock, miller at Rutland Mill, have been appointed churchwardens of the parish of Ilkeston for the coming year. The annual meeting of the Ilkeston Gaslight and Coke Company is to be held, next month, on August 7th. However any enterprising investor may pick up twenty shares in that Company before then … I see, from the Nottingham Journal, that they are on sale by private contract. If interested, the man to contact is John Wombell, secretary to the said Company. Samuel Turton is a blacksmith and beerhouse keeper of Bath Street … and a few days ago he received two uninvited and unwelcome visitors to his establishment. On Thursday night, July 20th, after 11 o’clock, Samuel heard a knock at his locked front door and when (after some time) his wife Catherine opened up, who should stand there but my old friend George Small, parish constable and William Wragg, the superintending constable ? Upon entering they found Samuel ‘entertaining’ three men, some bread, cheese, and ale on the table. Obviously had he been serving them after 11 o’clock,and this was contrary to the tenure of his license — but Samuel argued that only he was drinking and they were all merely talking about the war !! Not convinced, the constables ‘invited’ Samuel to plead his case at the next Petty Sessions at Smalley in early August. My old friend George Small and his companion constable William Wragg have been very busy of late. Yesterday they visited the Nag’s Head Inn in South Street, kept by Joseph Knighton, again after 11 o’clock. And again they knocked on the locked front door, but this time with a different result … no-one answered !! The noise from inside clearly indicated that someone was at home, but in spite of calling to be let in, the door remained barred to them. George then went round the back, just in time to intercept two men and a woman leaving the premises. Like Samuel Turton, Joseph Knighton is due for a day at Smalley Petty Sessions as a consequence. Yesterday was Samuel Turton’s day in court. Like the two constables who had visited his Bath Street residence, the two magistrates were not convinced by his story. ‘ You must clear the house at the proper time; and if the company will not go you must fetch the constables to assist you. If you cannot keep the master of your own house, you are not fit to keep a beerhouse’. Thus spoke Magistrate Needham, just before he fined Samuel £1 with 14s costs. Then up stepped Joseph Knighton. Unfortunately for him he has a previous conviction for keeping a disorderly house — thus his fine was £2 10s with 15s costs. Yesterday’s Derby Mercury printed a condensed article on Ilkeston’s Parish Church, taken from the Leicester Advertiser … which I further condense here. The article begins by describing St. Mary’s as ‘one of the finest in the county of Derby … possessing very rare examples of decorated tracery … a unique chancel screen, executed in Petworth marble and Ancaster stone .. and two very fine tombs ….. (it is) a highly interesting example of Mediævel art’. It continues by describing the style of each part of the church, both extant and extinct, with suggested dates of when each was built. For example, the South arcade of the nave dates back to the reign of Henry II or Richard I (that is, to about the mid 12th century) while the tower and spire (both allowed to decay and fall down) were built slightly after this. The Chancel screen, the Chancel, a sacristy, the nave, the south and north aisles, the interior mouldings and windows, a Chantry Chapel (which fell down in 1714) … all are described and dated. And now to the Restoration of the Church ! A Building Committee was set up, which resolved that the names of six architects of reputation should be forwarded to the Duke of Rutland who would select the one he saw as most qualified to oversee the renewal. The Committee has been raising funds and so far £500 has been raised by the working-classes, the Duke of Rutland has given £200, the Vicar and his relatives upwards of £600, with many other welcome and generous contributions. It is estimated that a total of £3000 will be needed, two-thirds of which has now been pledged. The article ends with an entreaty to all readers to help push the total up to the sum required as ‘the proposed enlargement of the church is the most desirable mode of providing for the wants of the parishioners’. I have snipped this advertisement from the latest edition of the Ilkeston Pioneer. As you will see, many of the prominent and more wealthy tradesmen of Ilkeston have sponsored the movement for the establishment of a waterworks for the town which also has the support and concurrence of the Duke of Rutland. Interested investors have until August 19th to pledge their deposits, after which shares in the company will be allocated. I remember reading in the Pioneer of Autumn last year, an impassioned letter from ‘Aquilegia’ in which he advocated the establishment of a clean and plentiful supply of water for all in the town — it appears that his plea has at last borne fruit ?? A superlative performance by bowler John Paxton in the cricket match, held by the Rutland Club against Newark Club, played over the last two days at the Duke’s Ground in Ilkeston. In the first innings the demon bowler took eight of the ten wickets while in the second he could manage only five !! He was ably assisted by Tommy Attenborough and Joe Horsley however. The home side ran out easy winners. I note the passing yesterday of William Bell, publican at the Travellers’ Rest in the White Lion area. I am sometimes amazed at how quickly a man might tire of his wife. John Curtis, who is a carrier living in Bath Street, married his wife Selina just 18 months ago. Now he is being charged by Basford Union with neglecting to maintain his wife whereby she became chargeable to the parish of Ilkeston. He has been ordered to pay the costs of maintenance plus the conviction costs involved in this criminal case … a total, I am informed, of over one guinea … a refusal to pay will lead to a well-deserved month in Derby jail with hard labour. The Nottinghamshire Guardian does not hold the horticulturalists of Ilkeston in very high esteem … and seems to know exactly who to blame for the fall in the standards of the gardening fraternity. (The Ilkeston Floral and Horticultural Society) held its annual show in the National School Room on Thursday last. The articles exhibited were not so good, either as regards quantity or quality, as we have sometimes seen. This is to be attributed to the disinclination of the working men of Ilkeston generally, to pursue other than the beaten track, to produce vegetables or flowers of a better quality than they have been accustomed to — a feeling, the prevalence of which is to be deplored’. …. so now you know !! Notwithstanding, prizes were presented in all classes, by the judges Lambert Small and John Glossop, both of course of Ilkeston. In October of last year I described the nascent steps being taken within the town to rescue the Parish Church. Persons desirous of sending in Tenders for the whole of the Works proposed, in order to effect the ENLARGEMENT and RESTORATION of the CHURCH of SAINT MARY, at ILKESTON, in the County of Derby, may see the Plans and Specification, at the Offices of the Architect, MR. THOMAS LARKINS WALKER, 6 New Street, Leicester, or at the Girls’ School Room, at Ilkeston, on and after, Wednesday, October 11th. Bills of Quantities and Forms of Tender may be had of the Architect by application either personally or by letter, on and after Wednesday, October 11th, 1854. Sealed tenders to be delivered to the REV. G. SEARL EBSWORTH, Vicar, on or before Wednesday, October 18th, 1854. It is expected that several local builders will show interest in this extensive project. It seems that Ilkeston has lost its oldest (!) newspaper … the Ilkeston Pioneer has ceased publication !! No prior notice was given and I can find no reason for the disappearance. However rumours are circulating !! I am not one to repeat unfounded gossip .. usually .. but on this occasion … !! John Wombell, the proprietor of the Pioneer, was expelled from the Primitive Methodist Chapel in 1851, the reason being his injudicious behaviour with Maria Beardsley. Maria was then about twenty years old while Mr Wombell was nearly twice her age … and married with three young children. It seems that the liaison continued and just over a year ago Maria gave birth to a son. And now, a year later, we have a death. Are the two connected ? Domestic disputes have been simmering at Hungerhill !! Earlier this month a young married woman, Ann Webb, felt the need to take her case to the Smalley Petty Sessions. She alleged that the son of her neighbour, glove maker Richard Blake, had assaulted her. The altercation with the lad, William, had started just after she had cleaned her yard — he walked up to her property and threw dirty water where she had just cleaned !! … Not before she had thrown her own dirty water onto the Blake’s premises, claimed the lad. Mops and dust-pans were brandished, and used as offensive weapons, it seems. That case was impatiently dismissed by the magistrates, but two weeks later the same parties were back at the same place. This time Ann Webb was ‘in the dock’ and once more ‘dirty water’ was the cause of the complaint !! Richard complained that Ann had emptied a bucket of suds close to the local spring of water, and some of the suds had run into the well … Ann had been too lazy to take her dirty water to the proper sewer. Her laziness was proved and she was ordered to pay a 5s fine with 20s expenses, or a month in jail !! That case was settled yesterday … and let us hope that this senseless feud has also been settled. The Nottinghamshire Guardian is reporting great events and prosperous times for our ‘little town’. During this past week, following Michaelmas Day, the annual feast which began on Sunday has brought great bustle to the town, such has never been known before !! Local butchers have slaughtered more than twenty fat beasts for the festivities … festivities which, on Monday, drew a throng of visitors into the Market Place, to enjoy the stalls and shows there. The newspaper also reports that the new collieries and iron works in the parish have caused the town to further flourish … this past summer over 100 houses have been (or have started to be) built, and all of them let as soon as they are completed. What a popular town we live in !! I believe that the recently bankrupt and erstwhile Churchwarden, Henry Mantle Hitchcock, of the Rutland Mill, has now left the town to return to his native Leicester. At the Mill tomorrow there will be a sale of most of his business holdings … horses, poultry, greyhounds, carriages and waggons, carts, harnesses and good quality hay. And Henry is due to appear at the District Court of Bankruptcy in Nottingham on November 7th. A correspondent to the Nottingham Journal writes that …. It also appears that this correspondent does not know the people of Ilkeston too well !! The Quarterly returns of this sub-district’s Births and Deaths have just been published. Deaths, of 62, are slightly above the average but the good news is that only three fatalities from fever and one from scarlatina were reported … despite the fact that both diseases prevailed extensively. However 16 deaths from diarrhoea were registered. Much greater regard has been paid to vaccination, and consequently smallpox has not appeared anywhere in the sub-district. The number of registered births was 140. It appears that Aaron Aldred, proprietor of the Queen’s Head Inn in Bath Street, is not well-versed in the law … at least with respect to the regulations pertaining to the keeping of licensed premises. On October 30th last Charles Hampson, a horse breaker who lives down Nottingham Road I believe, visited the Inn to meet a friend, was persuaded to stay and then entered into a few games of bagatelle …. the winner being rewarded with free ale bought by the losers. And who should win ?!? Yes, you guessed it !! ‘Visitor’ Charles won several games which rather annoyed the regulars … such that one of them was so peeved that he personally presented the ale to Charles, while it was still in the jug !! Charles saw the jug flying towards him, whereupon he ducked, allowing the jug and its contents to serenely continue their journey. The result was broken crockery and damaged furniture. Landlord Aaron now intervened and snatched Charles’s hat to keep as ransom for the damage caused. Unfortunately in the ensuing melee the hat itself sustained severe damage … hence, yesterday Charles stood facing Aaron at Smalley Petty Sessions where he demanded recompense for his hat. The judges were sympathetic to his case and fined the landlord with costs. This however was not Aaron’s only problem … he was now charged by William Wragg, the superintending constable, with allowing gaming on his premises, contrary to the tenor of his licence. And who should give damning evidence in this case but horse-breaker Charles, not the most sympathetic of witnesses. In his defence Aaron argued that the drinkers that evening were merely playing for ale (!!) and he was not aware that this was ‘gaming’ (!!!) …. … an argument somewhat convincing … but not totally !! Aaron received a further fine and costs. He left court £2 poorer than when he had arrived. For several weeks now Henry Mantle Hitchcock, the young miller of Rutland Mill, has been embroiled in this proceeding … and some dispute has arisen centering around a debt supposedly owing to Henry’s father, Henry senior, also a miller and coal merchant trading in Leicester. Henry junior arrived in Ilkeston about March 1850, taking up the lease of the mill while his father agreed to supply him with corn as and when he needed it. As a consequence of this arrangement a debt of around £3500 had been accumulated … the father had forgiven £1000 of this but there was still a large sum outstanding. A question hangs over who is the principal of the mill — Henry junior or Henry senior — and whether the father has ‘loaned’ money to the son as he states, or whether the money was a gift, as the son states !! I think that the case has been held over until January of next year. And while the saga of miller Henry Hitchcock continues, his personal effects were up for auction yesterday. I am not aware how this sale concluded or how much was raised. Yesterday another meeting in the continuing bankruptcy saga of Henry Mantle Hitchcock, and … would you care to guess ?!! This was the scheduled ‘last examination’ but as the balance sheet was not ready, it was agreed to adjourn until January 2nd. Another year, another meeting !! Ilkeston’s annual Christmas Fair and Cattle Show will in future (and starting this year) be held on the Thursday but one before Christmas Day, instead of the first Thursday after Christmas Day. This will be December 14th. By order of a special committee appointed to alter the day. The inhabitants of Ilkeston were startled from their propriety on Tuesday evening, by the appearance, in the streets, of a party of natives dressed in soldiers’ clothes, with drum, fife, triangle, and flag, under the guidance of a worthy corporal of Grenadiers stationed here, busily engaged in ‘beating up’ for recruits. Crowds of admiring youngsters followed the party, who traversed the streets, stopping in their progress at every public-house for the purpose of refreshing the inward man with copious draughts of John Barleycorn, rendered necessary, owing to the very violent exertions the party made to fulfil their arduous duty properly. This was carried on rather longer perhaps than some would have thought required, for the drum was heard, and the shrill fife poured its notes on the breeze until ‘the witching hour’ was passed. And being out of town, I missed it all !! Readers will no doubt be aware that the conflict in the Crimea has been raging for over a year now. Recent battles at Alma, Balaclava and Inkerman have left the allied forces in a strong position, besieging the Russian positions at Sevastopol — all expect this naval base to fall into our hands very shortly. I just caution that expectations can soon be dashed !! Today, the marriage of Thomas Walton, master of the British School in Bath Street, to Mary Earle, former schoolmistress at the Girls’ National School in the Market Place. Three days ago the premises of Thomas Hives — the Rutland Arms — were visited by Caleb Tunley, Inland Revenue Officer, acting in his professional capacity. He left about 9 o’clock that Tuesday evening, the 26th, quite sober, leading out his horse from the Inn, and made his way towards the canal towpath, on his way home. The following morning his dead body was found on that same path, completely saturated, with his money intact and no signs of violence upon his body. It is believed that he died from exposure. He leaves a wife, at least one adult son and several other dependent children. The teachers and choir of St. Mary’s Church held their usual Christmas Party yesterday, with the vicar and a group of friends all joining in, to enjoy tea — ‘the cup that cheers but not inebriates’. Glees were then sung, after which there was a pleasing lecture on the ‘Holy Land’ delivered by the curate, the Rev. John Charles Hall Deacon, who has visited that place; he took the audience on an imaginary journey from Beyrout to Jerusalem which kept his listeners enthralled for almost an hour. The gathering then sang the National Anthem and all departed fulfilled and instructed. And a happy New Year to all ! !